MaxAmps.com brings you the latest in LiPo battery technology with our LiHV+ Plus series. These high voltage batteries will take your high-demand flight applications like FPV racing to the next level of power and performance! High voltage(HV) LiPo batteries can be safely charged to 4.35v per cell resulting in more power and longer flight time compared to standard LiPo batteries that can only be charged to 4.2v per cell. This higher starting voltage yields higher voltage under load, allowing you to fly faster, longer. You can still charge these LiHV+ batteries to only 4.2v per cell on a standard LiPo charger if preferred and they will perform like a standard LiPo battery. To unlock their full performance potential though, you will need a LiHV capable charger. 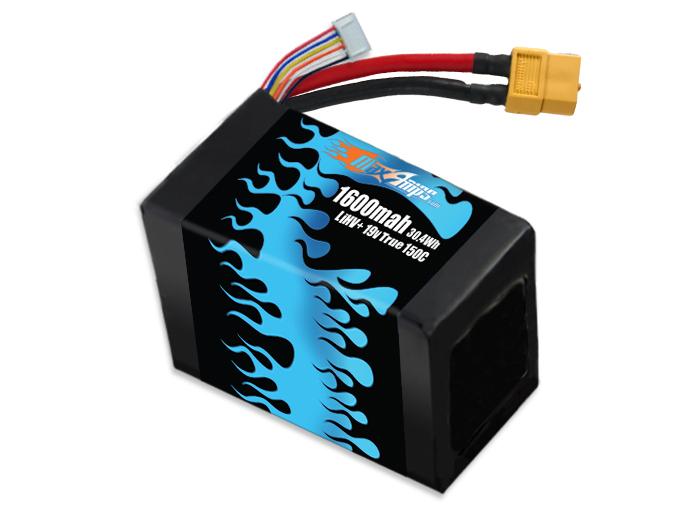 Popular high-speed battery option for FPV racer racing quads that have been upgraded to run a 5S LiPo battery.